Chromium trioxide and water will oxidize aldehydes to carboxylic acids. 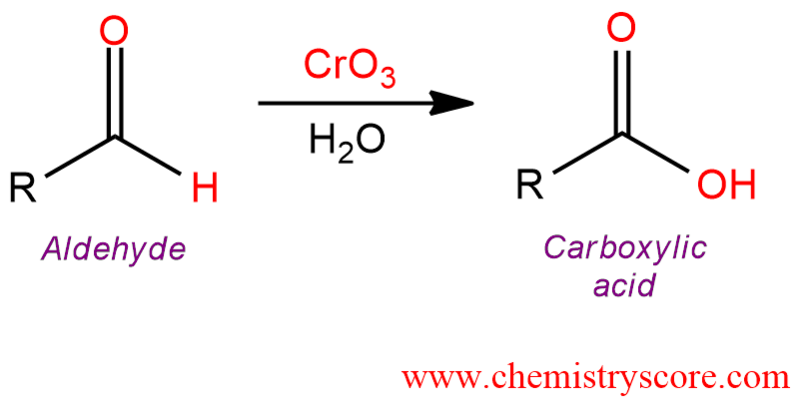 The most common oxidation reaction of carbonyl compounds is the oxidation of aldehydes to carboxylic acids. As the oxidizing agents in these reactions, the following reagents can be used: CrO3, Na2Cr2O7, K2Cr2O7, and KMnO4. Cr(VI) reagents are the most common used oxidation reagents. 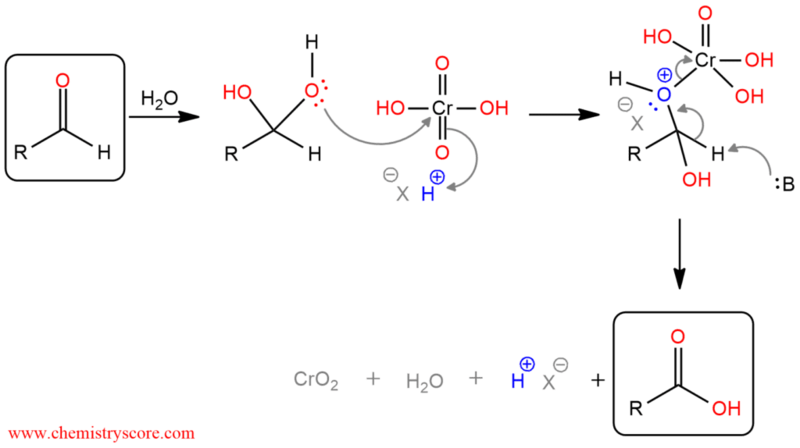 Ketones do not undergo this oxidation reaction because they have no hydrogen bonded to the carbonyl group. Potassium permanganate, KMnO4, is a powerful oxidizing agent and has many uses in organic chemistry. It is able to oxidize carbon atoms if they contain sufficiently weak bonds, and the products that are obtained can vary depending on the conditions. At high temperature, ketones are cleavage oxidized by a strong oxidizing agent like KMnO4. The most effective conditions for aldehyde oxidation by KMnO4 involve t-butanol as a solvent with a NaH2PO4 buffer.